hub is being moved to separate files. This work is now complete for most hubs. Note, 2-speeds are covered on our coaster-brake page, though some are brakeless. The coaster-brake page also offers general information applicable to hubs with coaster brakes covered on this page. Since the first decade of the 20th century, internal-gear hubs, usually 3-speeds, have offered a practical, reliable gear-shifting option to the cyclist. With the popularity of derailer gears taking off in the early 1970's bike boom, internal-gear hubs went out of style in most US markets. This is unfortunate, because many casual or utilitarian cyclists are best served by this type of gearing. Internal-gear hubs are more reliable than derailer systems, and require much less maintenance. The step-up ratios of their top gears make oversize chainrings unnecessary on small-wheel folding bicycles. Unlike derailers, internal-gear hubs can shift at a stop, very nice in stop-and-go urban traffic. Internal-gear hubs tend to be heavier than derailer systems, and are slightly less efficient in some gears. A direct-drive middle gear can be more efficient than in a derailer system, as there is no drag from derailer pulleys. Most internal-gear hubs cannot have a quick-release axle. If you are interested in old bikes, or the history of this sort of gearing, refer to my page on English Three Speeds. Internal-gear hubs work on the principle of "planetary gearing." The basic 3-speed hubs have a single "sun" gear solidly attached to the middle of the axle. 3 or 4 identical "planet" gears mesh with and revolve around the "sun" gear. The "planet" gears are surrounded by (and mesh with) a "gear ring" with its teeth on the inside (an inside-out gear). Low Gear has the sprocket driving the gear ring, while the planet cage drives the hub. Thus, the wheel turns 3 times for every 4 revolutions of the sprocket, lowering the gear by 25%. Middle Gear has the sprocket still driving the gear ring, but has the gear ring drives the hub. Thus, the drive is direct. Although the internal gears are always rotating when the sprocket is in motion, they don't have any effect on the drive in middle gear. High Gear shifts the sprocket's drive to the planet cage, while the gear ring continues to drive the hub shell. Thus, the hub turns around 4 times for every 3 sprocket revolutions, giving a 33% gear increase. There is a more detailed explanation of this on the Sturmey-Archer Web site, from which I lifted the image above. Hubs with more than three speeds use two or three planetary stages, and/or compound (stepped) planet gears with two or more sets of teeth side by side -- see John Allen's article describing these in more detail. Compound planet gears must be "timed" when rebuilding a hub -- aligned so the teeth of the different sections mesh correctly -- or else the hub will run roughly and may be damaged. In the late 1990's, internal gears underwent something of a renaissance, with the development of wide-range 7-speed hubs. Progress has continued since. Four different brands are currently available, with as many as 14 speeds. Three-speeds and five-speeds are still currently in production, and they offer an economical, practical alternative. Older internal-gear hubs have an oil fitting on the shell. Oil lubrication generates less drag than grease and washes wear particles, dirt and water out of the mechanism. Use machine oil, not a spray lube or other thin oil. Unless a hub has sealed bearings, also use grease, to form a seal at the bearings and help keep the oil in. The Rohloff Speedhub and the Shimano Alfine 11-speed hub are oil-lubricated. Other current internal-gear hubs are supplied grease-lubricated. As sold, they require periodic cleaning and replenishment of a special grease that does not make the pawls stick. Shimano sells a relubrication kit for grease-lubricated hubs. Still, many hubs are inadequately lubricated as sold, and frequent failures of grease-lubricated hubs due to water contamination have been reported in wet climates --see photos here. Better lubrication sidesteps this problem. It is best to add oil to the lubricant regimen when rebuilding a hub, so it gets a clean start and you regrease the bearings at the same time. This is desirable even with a new hub. Follow the example shown in the photos from Aaron's Bike Repair (near the bottom of the page, after you get past the horror-show photos of rusted parts at the top). Use plenty of waterproof marine grease (as used in boat-trailer wheel bearings) for the bearing assemblies -- this keeps water out and oil in; use lightweight white lithium grease for the gears, especially with modern wide-mouth hubs that hold oil poorly; Phil Wood Tenacious Oil on the pawls and in the shell to slop around and get to where the grease didn't reach. An internal-gear hub with a hollow axle may be re-oiled by removing the pushrod or indicator spindle and squirting oil into the end of the axle. The SRAM i-Motion 9-speed, disk brake model, can be oiled through a disk brake rotor hole. Plug all the holes with machine screws between oilings. On a hub which doesn't allow one of these tricks, you could install a Sturmey-Archer oil cap. Tools: #3 (or 5.5 mm) drill and a 1/4 inch 28 TPI tap. You do need to disassemble the hub so you can clean out the metal chips. A simpler but less convenient approach is to unscrew the left bearing cone and squirt oil in past the left end of the axle. Oil can accumulate on the hub shell, and can become a bit messy, but, big deal. On the other hand, if used to excess, oil can run down the spokes onto the rim, soften the brake shoe rubber and make a rim brake squeal and grab. This is hazardous in a front wheel, but the internal-gear hub is in the rear wheel. Cleaning the oil and brake-shoe rubber deposits off the rim restores brake function. Also, it is best to store your bicycle in an unheated (but dry) area. When you take it out from a heated area in cool, moist -- or wet -- weather, the air inside the hub contracts, pulling in moisture. If you must store your bike in a heated area, be especially careful about keeping the hub oiled. Old Sturmey-Archer coaster-brake 3-speeds have an oil fitting, but other hubs with a coaster brake require a special high-temperature grease for the brake shoes. Some hubs use a different grease for the rest of the mechanism, so the pawls don't stick. A coaster brake in an internal-gear hub is, all in all, a poor idea because of the wear particles it generates, and because you can't use oil lubrication. Oil lubrication may cause problems with a drum brake, by seeping out past the bearing and contaminating the brake shoes. Phil Wood Tenacious Oil stays in place better than most other oils. Unlike with a derailer bicycle, if you must store or transport the bike horizontally, lay it on its right side. This will prevent oil from leaking into the drum. Place something under the rear wheel to catch the drip, especially if you have just oiled the hub. Shimano Rollerbrakes supplied with internal-gear hubs are outside the hub shell, avoiding the contamination problem. These use steel brake shoes inside a steel drum and require periodic lubrication with special high-temperature grease. Internal-gear hubs typically use a single sprocket and single chainwheel. The chain is held in place by moving the hub's axle forward or backward in the dropout slots until the chain is just barely slack, or a bicycle with vertical dropouts may have an eccentric bottom bracket. As the chain wears, it lengthens, and it is more likely to fall off. It must be readjusted periodically. A freewheeling hub -- not a fixed-gear or coaster-brake hub -- may use a chain tensioner with a pulley instead. More detail is on our page about derailerless drivetrains. The axle is part of the gear train of an internal-gear hub. You can check this out for yourself. If you hold the hub shell or rim when the hub is not installed on the bicycle and turn the sprocket, the axle also turns -- backward if the hub's drive ratio is lower than 1:1, forward if higher. With most hubs, special anti-rotation washers keep the axle from turning when the wheel is installed on the bicycle. These washers engage flat surfaces on the axle, and have tabs that fit into the dropout slots. Different washers fit different models of hubs and dropout-slot widths. Many newer hubs attach the shifter cable to a pulley that rotates around the hub's axle, between the right dropout and the sprocket. Depending on whether a bicycle has horizontal, vertical or reversed (track) dropouts, different washers are needed so the shift cable can approach from the front of the bicycle. Follow the instructions for each hub. A hub brake of any kind also must resist rotation. Coaster brakes and drum brakes on internal-gear hubs use a reaction arm for this purpose, separate from the anti-rotation washer(s) for the gearing. You must still install anti-rotation washers. The Rohloff internal-gear hub does not include a brake, but has such a wide gear range that some models use a reaction arm and others, a bracket which attaches to disk-brake tabs. On a bicycle with rear suspension, the suspension's pivot is usually ahead of the rear hub. Because it tries to rotate the hub's axle, an internal-gear hub lifts the rear end of the bicycle in gears below 1:1 and lowers it in gears above 1:1. The resulting "pogo-sticking"affects pedaling efficiency to a degree which depends on the design of the suspension and the gear selection. By selecting an appropriate-sized sprocket and chainwheel, the overall range of any internal-gear hub can be raised or lowered by any desired amount. 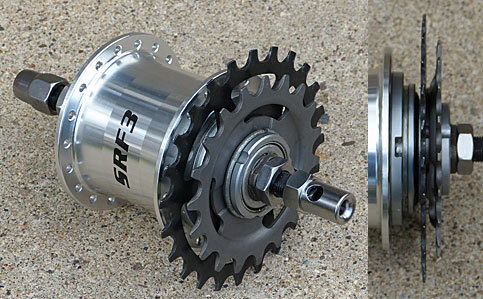 Most current internal-gear hubs take 3-splined sprockets with 1 3/8 inch inside diameter, interchangeable among brands. These sprockets are available from various sources from 13-24 teeth, though some hubs can't accept the smallest sprockets. A 3-lug sprocket for 1/8"chain. This sprocket has 22 teeth. The Rohloff uses a special threaded sprocket; the SRAM i-Motion 9, G8 and G9 hubs and Sturmey-Archer 8-speeds use proprietary lugged sprockets; a few Sturmey-Archer models have 9 splines like a Shimano Freehub. Model numbers for these Sturmey-Archer hubs end in "(N)". Many of the common 3-lug sprockets are made for 1/8" chain -- wider than the chain used with derailer gearing. The wider chain can be used with thin chainwheels made for use with derailers, though special track chainwheels have teeth that are both taller and wider, and allow the chain to become looser before it could fall off. 3-lug sprockets for derailer chain are sold, stamped with raised sections around the hole so they fit the hub the same way as thicker sprockets. With the narrower sprockets, use chain made for a 7-speed or 8-speed derailer system. 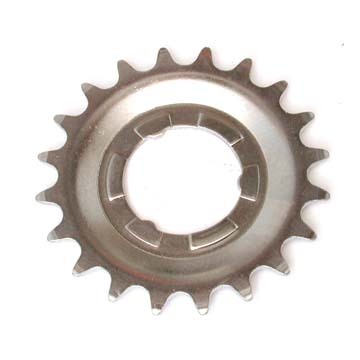 The sprocket of most internal-gear hubs is held in position by a spring circlip (snap ring). The circlip can be pried off with a thin flat-blade screwdriver, and the sprocket can then be lifted off. Most sprockets made for this system (including those shown above) are "dished" so you can adjust the chainline by flipping the sprocket over. The circlip snaps on, also most easily by levering it into position with a flat-blade screwdriver. Some hubs will accept a smaller sprocket dished outward than inward, due to interference problems. Some hubs have one or two spacer washers in addition to the sprocket. Changing the order in which the spacer washer(s) and sprocket are installed on the hub can adjust the chainline. Except with a fixed-gear or coaster-brake hub, it is possible to double the useful life of a 3-lug sprocket by flipping it over so the wear is on the other side of the teeth -- as long as you can achieve a good chainline. After re-installing the sprocket, it is a good idea to seat the circlip by going around it and tapping it lightly with a hammer and punch. This is especially important on a hub with a coaster brake, because the brake will fail if the sprocket slips off. It is also fairly easy to modify any Shimano cassette sprocket that doesn't have a built-in spacer. These are available from 14-34 teeth. Shimano cassette sprockets have the same internal diameter as those used with internal gear hubs, but have 9 splines instead of 3. With a suitable grinder, 6 of the splines need to be removed, and the corners of the remaining three rounded off. A thin spacer washer may also be needed, because the cassette sprockets are a bit thinner than the stock sprockets. On a Sturmey-Archer (N) hub, you may use an unmodified Shimano Freehub sprocket, but you may still need the spacer washer. You may also adjust the gear range by changing the chainwheel, though that is usually more expensive than changing the sprocket. If you install a larger sprocket or chainwheel, you also will need a longer chain. Some internal-gear hubs also are available with Gates Carbon Drive belt drive. This has proven reliable but has its own special issues. In particular, chainline -- well, beltline -- is more critical than with a chain, and the belt must always be slack when removing and installing it. Levering it off the side of a sprocket will damage it, leading quickly to failure. Go to Sheldon's Gear Calculator to scope out the possibilities. John Allen's table of internal-gear hub ratios allows you compare ratios of the different hubs. All current three-speeds except for the Sturmey-Archer S3X fixed-gear hub have a wide range, with big steps between all of the gears. The way bicycle manufacturers commonly set up three-speeds, the middle gear is too low for level-ground riding, to keep the top gear from being completely useless. A 3-speed hub will serve you much better if you install a larger rear sprocket or smaller chainwheel, and use the top gear on level terrain. The low and middle gears are then better for acceleration and climbing. If you spin out on downhills, then you can coast. Sheldon disparaged coasting, but really, occasional coasting is better than struggling up hills and having no level-ground gear! The top gear with a 3-speed should usually be in the range between 70 and 80 gear inches (5.6 and 6.4 meters development, 5.0 to 6.0 gain ratio), depending on your strength and pedaling style -- say, a 46-tooth chainring and 22-tooth sprocket with a 26-inch rear wheel. If the terrain where you ride is all up and down, with little or no level ground, you may want even lower gears than that. Clip-in pedals or toe clips and straps (practical only without a coaster brake) help you pedal at a higher cadence, so your power range is wider -- an advantage on any bicycle but more so on one with big steps between gears. An internal-gear hub with 5 through 8 speeds generally works best if your level-ground gear is the second-highest gear, around 70 gear inches (5.6 meters development, 5.0 gain ratio, more or less depending on your strength and pedaling style). You will then have one higher gear for downhills and tailwinds. If you ride where there are no steep climbs, you may want the third-highest gear of a 7 or 8-speed hub to be the level-ground gear, so you don't spin out when you have a strong tailwind. All current 5-speed hubs have enough range for smart acceleration in urban riding. Hubs with 7 or 8 speeds also offer lower gears for climbing, and generally, smaller steps between gears. If a hub has 9 or more speeds, you generally want to the level-ground gear to be the third-highest. Again, as with the hubs with fewer speeds, this depends on terrain. Hybrid gearing uses an internal-gear hub along with derailer gearing. Sturmey-Archer makes, and Sachs/SRAM used to make, 3-speed hubs with splines for a Shimano or Shimano-compatible cassette. These hubs are especially useful on bicycles which can't take a front derailer, and on small-wheel bicycles, where the hub's step-up top gear makes an oversized chainwheel unnecessary. The stock cassettes sold with these systems work OK, but I (John Allen) like other combinations better. The stock Shimano CS‑HG50‑8 8-speed cassette, 11-13-15-17-19-21-24-28, works well with a small wheel. On the older Sachs 3x7 system with the short 7-speed cassette body, the Shimano M cassette, 13-15-17-19-21-24-28, or the D or F cassette, 14-16-18-21-24-28-32 is good, or an 8 of 9 on 7 leaving off the smallest sprocket of a stock Shimano XT or XTR cassette -- 12-14-16-18-21-24-28-32. To use the 8-of-9combinations, you need a 9-speed chain and a 9-speed shifter (or 8-speed shifter with alternate cable routing). It is also possible to build up a custom combination. Good 9-speed custom combinations are 13-15-17-19-21-23-25-28-32 and 11-13-15-17-19-21-24-28-32. With these hybrid gearing systems, choose the chainwheel so the smallest sprocket and the hub's direct-drive middle gear give about 75 gear inches (6.0 meters development, 5.5 gain ratio). This is typically your level-ground cruising-along gear -- it could be a bit higher or lower depending on your strength. It is best to avoid using a very small sprocket, which will wear quickly -- though on a small-wheel bicycle, it may be more practical just to count on replacing the sprocket frequently, to avoid having to use an oversize chainwheel. Use all of the sprockets with the hub in its most efficient, direct-drive middle gear. With the combinations recommended here, shifting the hub to the low or high gear gives you a couple of additional ratios at the top and bottom of the range, or a quick downshift as needed in urban traffic. You may add a front derailer and second chainwheel to extend the low end of the gear range. With any freewheeling internal-gear hub, you can have hybrid gearing using double or triple chainwheels. You must then also use a spring-loaded chain tensioner, which could be a rear derailer without a shifter and cable. In this way, you get to enjoy the quick shifting of the internal-gear hub in a hilly city such as San Francisco, and also have "bail-out" gears. Many hubs have splines wide enough that you could install two sprockets and shift them with a rear derailer. 13 and 15, or any two sprockets three teeth apart from 18-21 through 21-24 split the wide steps of a three-speed nicely in half. Use derailer chain, and sprockets made for it. Use a modified Shimano cassette sprocket (see instructions) for one of the two. 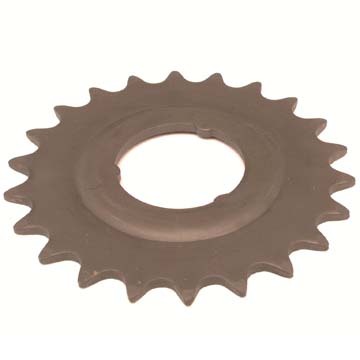 The other sprocket is a dished sprocket made for use with an internal-gear hub and narrow chain. Because such sprockets are usually stamped, like the one below, to fit in the space for a 1/8" sprocket, you might need to grind down the projections on the outward-dished side of the sprocket so you can fit all the necessary parts onto the hub's splines. That will also affect the spacing between the sprockets and the chain width which works best with them. Choosing the dished sprocket to be at the outside, as shown, or the inside, gives you two choices of chainline. With only two sprockets or two chainwheels, shifting is indexed even if the shifters are not! This setup will not give you as wide a range as hybrid gearing with multiple sprockets, but it does give 6 evenly-spaced gears. Sturmey-Archer makes a special three-speed used for hybrid gearing on Brompton folding bicycles. Some internal-gear hubs are not rated for the stresses from extremely steep climbs and a heavy load, a potential problem with do-it-yourself hybrid gearing. Usually, manufacturers rate hubs in terms of the acceptable chainwheel/sprocket ratio, but this rating really amounts only to "we will make it so hard to pedal that you will get off and walk." Pushing a lower gear up the same hill actually stresses the hub less. A small rear wheel and smooth pedaling reduce stress on the hub. These are apparently only being sold in the Japanese market. Installation is very similar to that of Shimano 7-and 8-speed hubs. -- see the article on installing Nexus and Alfine hubs. Thanks to Matt Dekker for providing the data on the Sturmey-Archer Sprinter. Thanks to Aaron Goss of rideyourbike.com for advice on lubrication.